30 Second Wine Advisor: Is good $8 Burgundy possible? 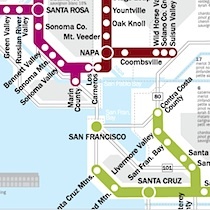 Is good $8 Burgundy possible? Did he just say "$8 Burgundy"? That's a joke, right? In a world where a bottle of 2009 Domaine de la Romanée-Conti La Tâche retails for around $3,400, if you can find it; and when even a more modest Burgundy like, say, Louis Jadot 2009 Clos de Vougeot Grand Cru will set you back $140 or thereabouts, the idea of an $8 Burgundy - much less a drinkable $8 Burgundy - seems faintly ridiculous. Yet I'm here to testify that I recently enjoyed a bottle of Blason de Bourgogne 2010 Bourgogne Pinot Noir with considerable pleasure, and its $7.99 price tag only enhanced the emotion. Was it great wine? Certainly not. But it was fresh, simple and crisp, a good food wine and a good, characteristic example of basic Burgundy Pinot Noir from an 800-grower Burgundy cooperative that produces affordable, drinkable table wines mostly for the European market. At that price, there's not much left to complain about. What we have here is mostly a case of expectations: I wasn't counting on a La Tâche experience and didn't get one. But I can't afford to pay La Tâche prices for everyday drinking, or, now that I think about it, for any day drinking. To be frank, with a limited number of good, interesting table wines for less than $10 in today's market, it's worth celebrating when you find one. Bourgogne Pinot Noir, the most generic appellation in Burgundy, may incorporate Pinot Noie grapes grown anywhere in the Burgundy region, although the chances that any of them came from vineyards favored by microclimate or history are slim. But in a good vintage, even the more modest wines can stand out, and Burgundy is shaping up with two decent, albeit very different, vintages in a row. The season of 2009 in Burgundy was one of those favored years that produced ripe red wines that are easy to enjoy; when you see an '09 within your price range, it's usually a safe bet. The 2010 vintage was a little more, um, "exciting" for the region's producers, with a combination of cool and wet conditions inspiring little hope until conditions improved toward harvest time. The result, according to early reports, tends toward wines more lean and acidic, yet with the character that well structured wines can show when fruit and acidity come into balance. Even at this bargain-basement price, the 2009 Blason de Bourgogne clearly says "Burgundy" from the glass. Look for it at your local Trader Joe's, or if you can't find this one, browse other 2010 Bourgogne Pinot Noir on Wine-Searcher.com. FOOD MATCH: The back label offers good advice: "simple supper dishes such as pasta and pizza or tuna niçoise." Don't overlook summer's veggie bounty. It was outstanding with a gratin of fresh farmers' market zucchini, yellow summer squash and new red potatoes. WHEN TO DRINK: Even simple Pinot Noir can reward cellaring, but at this price level it makes more sense to drink it up in a year or two. VALUE: Back up the truck to the wine-shop door. 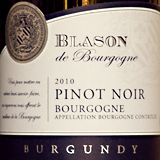 WEB LINK Here is Blason de Bourgogne's PDF fact sheet on the Bourgogne Pinot Noir. Wine-Searcher.com shows only sources in Europe and Asia for Blason de Bourgogne, hinting that Trader Joe's cornered the U.S. Market on this goodie. Check with your nearest TJ's outlet in hope it's in stock; contact importer Plume Ridge for information about other vendors, or use this Wine-Searcher.com link to browse other 2010 Bourgogne Pinot Noir.